It is important that you take good care of your laptop. Below are some simple steps you can take that will help keep your machine in perfect running order and require less maintenance. Keep Liquids Away From Your Laptop: Any type of liquid that is spilled on your machine can cause serious damage to the internal system board. Spill damage also makes the keys sticky and non-functional. 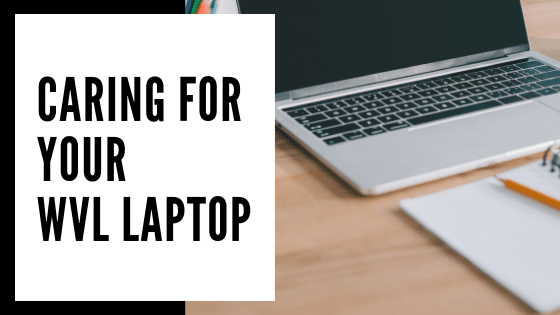 Hold Your Laptop by the Base: Lifting and holding the laptop by the display screen creates extra pressure on the hinges and can crack the screen. Protect the Monitor: Make sure there are no pencils, pens, small items, etc. on your keyboard when you close the lid. These items can scratch or crack the display screen. Keep Food Away From Your Laptop: Food particles can damage the keys preventing them from depressing totally and can also damage the internal circuitry. Close the Lid Properly: Close the lid gently and hold from the middle of the screen. Closing the lid using only the edges causes extra pressure on the hinges which over time can crack and break them. Disconnect From Power Carefully: Disconnect from the wall socket using the plug. Pulling the power cord can cause damage to the cord, socket and plug. Transport the laptop only when the power cord is removed from the laptop. Avoid leaving the power cord in a high traffic area that can easily be tripped over. ALWAYS TRANSPORT YOUR LAPTOP IN A BAG: Many breaks happen because of laptops being dropped or bumped. A laptop bag greatly reduces the risk of damage.